Info pratiche su dove fare downhill, freeride, cross in Italia con segnalazione di 4 percorsi per l'estate: Oropa, Livigno, Pila e soprattutto Val di Sole sede dei mondiali di downhill 2008. Anticipazioni sui mondiali Mtb 2007 e 2008. This was written as a ``Daily Blog'' of my bike trip from Venice to Rome. I had taken some Italian Courses at the University of Pittsburgh, and made friends with various Italians on the internet through an instant message program called SKYPE. I recruited my Italian Teacher to drive a support car, and I rode my bike. I was able to meet with 4 different people/families that I met online in my quest to learn the language and experience the ``real culture'' of the country. There are MANY pictures, and also quite a few VIDEOS of this trip. All links to photos and videos can be found on the index page. There is also a separate page for each day of the journey - my daily ``diary'' of surprises, delights, frustrations, and revelations. Even though I had only cycled in Italy before with organized cycling groups, I had an amazing trip doing this one alone. I am in the process of translating each day's blog into Italian, and eventually I'll try to post each day's road notes or route as well. Started Bakewell, UK and have completed half of the tour to inlcude cycling up the East of UK to Aberdeen, then Shetland Isalnds then a tour of the Faroe Islands and then a East West crossing of ICELAND to include the Kjlour Route. Currently crossing Greenland (unfortunately not on a bike but on skis) I then pick up my bike in Labrador (Canada) and cycle down through Newfoundland, Nova Scotia and then the US arriving in Plymouth Rhode Island in mid November. Then in late December I will complete the final leg of 270 miles non stop riding from Plymouth (UK) to Bakewell. 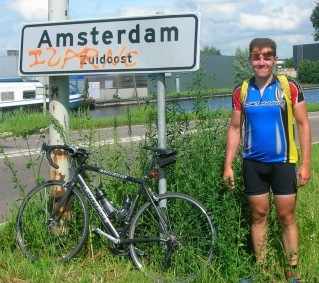 Cycling from Venice to Amsterdam in 8 days. Got a loooooooot of rain !!! A lightweight tour of the Swiss, Italian, and Austrian alps, 1501km, 33047m of climbing, and several passes. Eine anspruchsvolle Radrundtour auf Sardinien in 13 Tagesetappen über insgesamt 1126 km, Tagesetappen zwischen 60 und 110 Kilometern. In May, 2007, I spent 15 days cycling in north-central Italy and covered about 1600 km (990 miles). I cannot understate how great the trip was and I suggest anyone who is eager for culture, amazing food, adventure, and a physical and mental challenge to follow in my tracks. Wine-lovers will also find this route especially pleasing. The route begins and ends at Milan Centrale train station, providing an easy connection to the rest of Europe. Overall, the trip was flawless with only one flat tire. The route would be best suited for anyone who wants to cover lots of miles and see the main sights of north-central Italy (e.g. Venice, Tuscany, Cinque Terre, and Langhe/Roero). Although my trip was great, I would make some changes, and these are suggested below. I've briefly described the route and sights for each day. Please feel free to contact me for more specific information and advice (calebschiff@gmail.com). This is my first bike journey. I visited many places, and saw many things. I hope it inspires you to get on two wheels, instead of doing the usual airline-backpacker thing. Epilogue. ``Why have we come all this way to go cycling in Holland''. .............However when you compare the Danish section of the NSCR to Norway, say the NSCR, Rallarvegen or Numedalsruta, the Danish NSCR falls short in sheer WOW! factor. The Rallarvegen in particular has fantastic scenery and it a great challenge. It is also amusing to be cycling at an altitude higher than the highest point in the UK. The Numedal, although it changes considerably from the higher reaches down to Larvik, is just gorgeous and treasures such as the stave churches complement the beautiful scenery. Welcome to the Wish Tour! Below you will find the photos and journal from a two-year, 20,000-mile bicycle journey around the world. Starting in July 2005, this journal will take readers across the United States, Europe, Turkey, Uzbekistan, Kyrgystan, China, Tibet, Nepal, India, Bangladesh, Thailand, Laos, Vietnam, Cambodia, Malaysia, Borneo, Indonesia, Australia and New Zealand. The journey began more than 20 years ago, as the seeds of a dream to circumnavigate the globe were cultivated from a deeply personal and painful experience.